Summit County, Colorado is located in the center of the Rocky Mountains of Colorado with many activities and attractions for both the summer and winter. Part of the appeal of Summit County is that it is only one your West of Denver on Interstate 70. Summit County is an ideal mix of both metropolitan services for the millions of resort visitors, along I-70 and in the resorts, as well as thousands of acres of mountain high wilderness. In addition to the 4 Summit County Resorts, Vail is less than 10 minutes into neighboring Eagle county, Beaver Creek less than 20 mins, Winter Park is jus 1 hour away and Steamboat is 2 hours drive away. 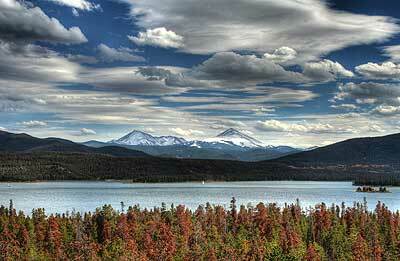 Summit County is also a popular destination for savvy summer visitors to Colorado. In the center of Summit County is 3,300 acre Lake Dillon where you can sail, motorboat, fish and kayak from two marinas. There are five challenging golf courses open to the public and hundreds of miles of paved and unpaved trails for all ability levels.� Keystone Resort, Breckenridge, Copper and Vail and the towns of Frisco and Dillon and Silverthorne are all interconnected by a mostly flat paved bike and walking trail that winds throughout Summit County and around Lake Dillon. If you are considering a visit to Summit County, further information can be found at www.SkyRun.com or at 1-877-SKY-RUN1. SkyRun Condos is the premier on-site provider of lodging in Keystone Resort Colorado.